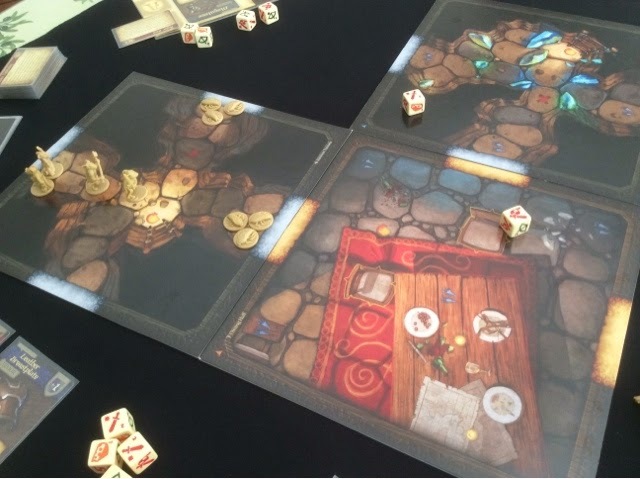 My friend enjoyed Mice & Mystics so much that he requested for a session to carry on the story without our other friend who found it boring. My friend brought his brother along who he says will surely love the game. Well, I was hoping to jump in again to get the not so flavorful taste out of my mouth, so I couldn't say no! I did a reread through of the rules and found an error we made on our first session. We rolled for defense even if the attack missed (that would have led to extra cheese for both sides - good and evil). Anyway, this time I'm sure we got most of the stuff pat down, especially after our first initial play. So off we went! Chapter 2! I resumed control of Collin and took control of the for now inactive Lily. We continued with the same party of Nez and Tilda, with Tilda being played with my friend's brother. We kept our new abilities for when we leveled up previously, and we also kept one search card we obtained. Anyway, chapter 2 started badly. We failed to roll good attacks nor cheese, and we let a bunch of measly roaches nibble away at our health. Before we were halfway through, Tilda had already been captured, and Collin's capture was imminent. Nez being the tank he is was our only reliable fighter. Due to the narrow pathways in chapter 2, Nez kinda blocked it off and fended off most of the roaches, with Collin trying to pick the pieces from behind when he was certain of not being outnumbered. Fortunately we managed to search and get healing items and attempting the side quest gave us much needed time in the form of moving the chapter end marker back. Fortunate turn of events ! At the final tile where we were supposed to rescue Lily, there was some confusion on when and how to pick the mousetrap. Could we do it in he midst of battle? Anyway we found the fork and grape prior and those were very useful in getting rid of the roaches that piled up due to the scenario rules and also to catapult Nez to where Lily was so that he could take the damage from the centipede. The funniest thing was, Tilda who was extremely useless till now, being poor at attack and cheese-less for healing, actually managed to slay the centipede with one daring and stunning blow. Her mace gave her extra dice per wounded mouse and with a 3 attack and no defense from the centipede, we made it out of harm's way in quite an unexpected way. The roaches feasted on the grape and died and all that stood in our way of victory were 2 rats. They were quite resilient though, but with Lily up and running we micehandled them eventually. Success! Tilda: "You shall not pass!" Lily: "Erm, Tilda? Everyone is dead. Thanks though"
Chapter 2 made me feel slightly better about the game. 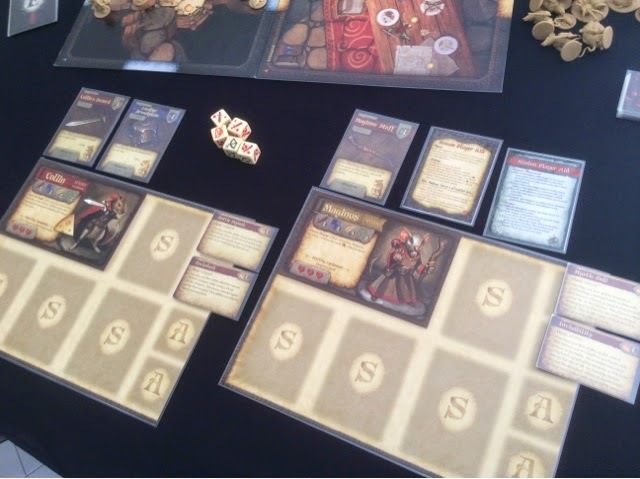 Being more familiar with the rules was nice, and being able to concentrate on the game was even better. 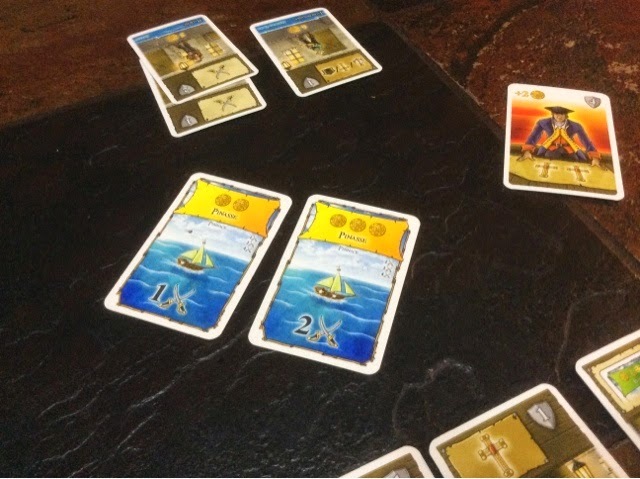 I think it was mostly because my friend took charge of reading the story and finding the special rules for each tile. I hope he got them right! I didn't question whatever he said we were to do. I guess I don't quite appreciate being the game master. Nonetheless, I still find that I get quite irritated by scenario specific rules and the placement rules etc etc. It requires a lot of looking up and being able to discern what is expected for the tile. Like when the minion spaces all have say 1 small minion each, where do I put a big minion? They take the whole space, do I just place them adjacent? Couldn't find it didn't care. We just put it closer to us so that it was made harder just to be sure. Anyway, I wanted to carry on with chapter 3! See what their reaction was. And, off we went! No objections! This time Maginos came back and Lily sat out. No change with Nez and Tilda. Chapter 3 was a breeze for us. We were neither in tight spots nor in a rush for time. We had some fortunate searches where we found catnip to rid our Brodie surge moment. Collin was on fire for searching. Every nook and cranny he searched turned to gold. Finding the catnip and potions and armor. None of which he used but selflessly sent along to his comrades. 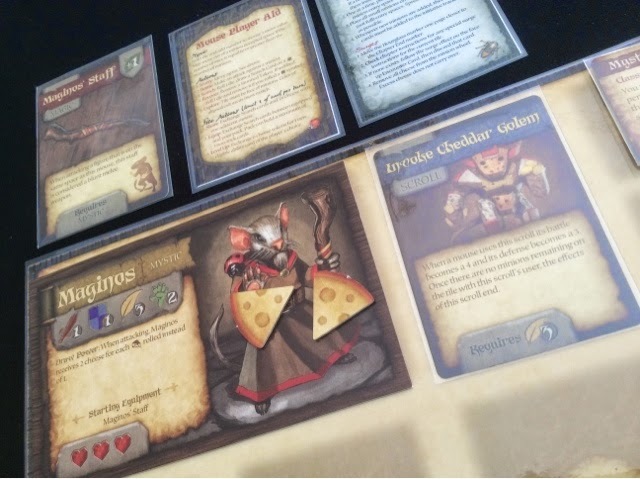 Maginos was in sharp form as well, finding the cheese golem and striking everything with his mystic bolt. Ranged attacks were falling left right and center. Like a boss they would say. Tilda stayed behind to heal and Nez was surprisingly a bystander in chapter 3. Due to the chapter arrangements, there were many elite rats and thus we were getting shot at from all angles. Maginos took the stage with confidence and Collin who was faster than Nez made sure he was right at the heat of battle while Nez ran around getting the special searches of the fork and disguises. What I liked about chapter 3 was how a previous achievement we earned in chapter 1 allowed us to - instead of fighting - gamble with a bunch of rats. We had a dice rolling fest with side bets of cheese to see who would reign supreme at the dinner table. It was a simple mini game but still rather exciting. Due to a search item found by Nez, we each received 2 cheese when the chapter marker moved forward. Those cheese gave us enough ammunition for our gambles. Nez was the big winner by doubling his cheese total, Collin showed his greed by gambling more than he should and ended up with half the cheese he started with. That was a nice break from all the hacking and slashing. A gambling break in the middle of our adventures. A nice little change of pace. 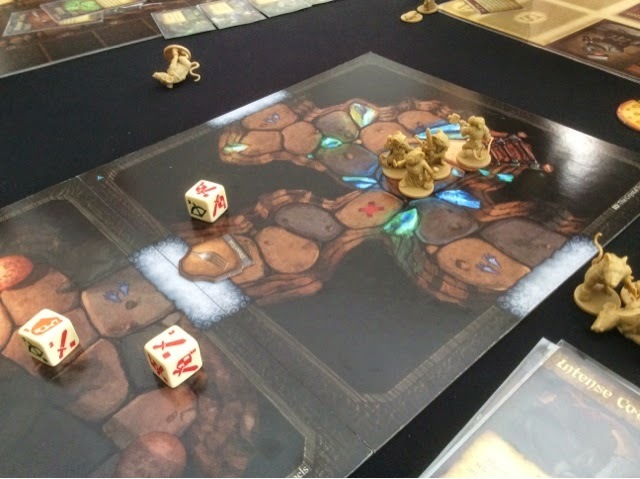 At the final showdown with the captain of rats and his minions, the golem scroll Maginos found was a most useful turn of events. The captain was beaten to a pulp and through a combination of a flying Tilda and Nez, so were the minions. The fork is super useful. Really. Worth finding each time. Being able to fly across the room is very efficient and opens up what you can plan to do for the current situation. Chapter 3 ended with enough time for us to throw a party and still make it out in time. I think we had 4 spare pages before the end. Which is the one sore point of the chapter. It was in chapter 3 that I found he gaming of the system slightly disappointing. We once again left a minion to its fancy and let it attack us without retaliation as we searched the room for lovely items. Seemed very strange thematically but I'm not sure what to do about it. If we killed the last minion, we will keep adding cheese to the minion wheel, which we don't want. We would rather take the risk of someone with a high defense tanking attacks while the rest spend their 1 search action per tile. That was very gamey and made me feel very uncomfortable with the game. But well, it is within the rules so we just went along to better our position in the game. Another small quibble about the game for me was the movement rules. The tiles have spaces that are very thematically drawn in but cause problems when it comes to mouse movement. The rules say as long as the distance between spaces can be bridge by the miniature, it is adjacent. But sometimes the bridging is so barely there that I find it uncomfortable saying it is adjacent, but how do I make sure? It might be small but sometimes that adjacentcy is all the difference between attacking now and later. And when time is of the essence, that small quibble becomes a medium sized one. Yup. 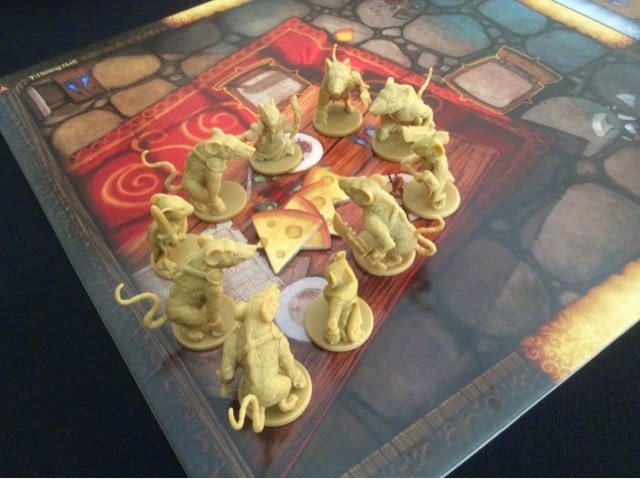 That was Mice and Mystics. I believe we are supposed to gather for chapter 4 sometime in the future. So let's see where that brings us. I might still sell it to my friend before he plays it finish and does not want to buy it from me anymore, haha. But I'm so in love with the art and the look of the game. Aigoo. Decisions decisions. 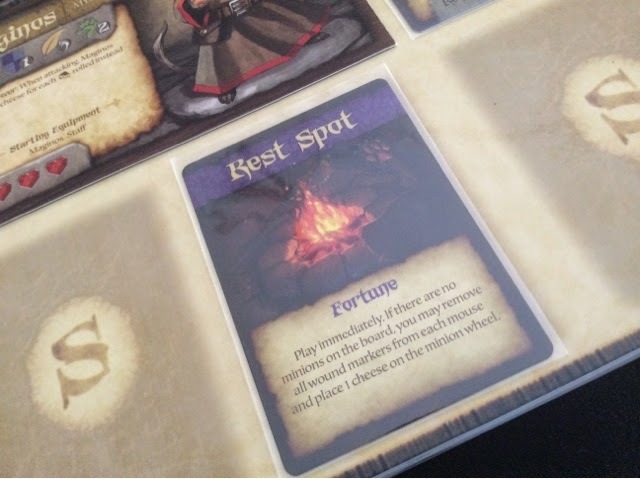 After Mice and Mystics, I took the chance to take out my new acquisition - Port Royal! I've been dying to play this game since my mum brought it back last week. 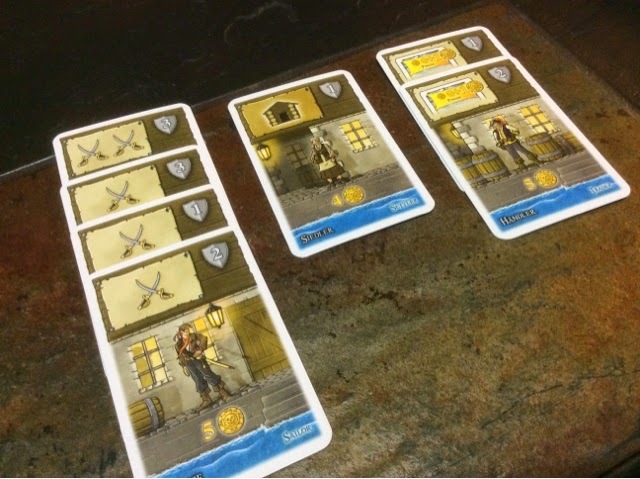 Port Royal is an engine building push your luck game. 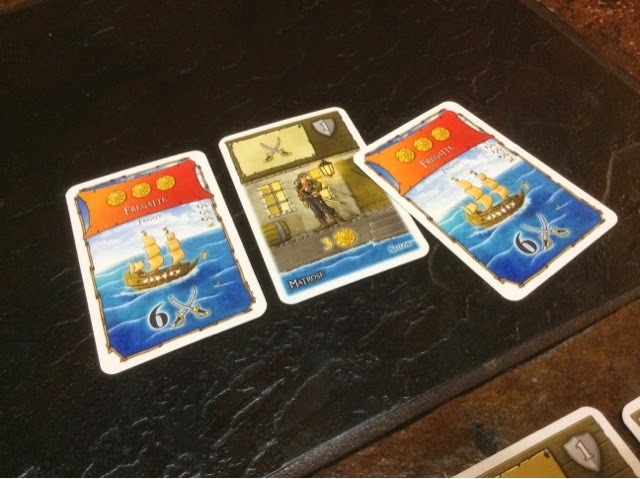 Each turn you flip cards from a deck and you either choose to stop and buy cards from what is revealed, or you are forced to stop (by drawing 2 ships of he same color) and your turn is over without being able to buy anything. You want to open more cards because the more different colored ships you reveal, the more cards you can buy from those revealed. If you stop early, all you can get is 1 card instead of a maximum of 3. These cards range from collecting instant money, to buying characters that help you to complete sets for money and points, or characters that give you abilities like buying other cards cheaper, or collecting 1 more card than you normally could, or allowing you to remove certain ships when revealed. So you have to decide which abilities are worth paying for at which time and how you want to gain your points (fulfilling objective cards or simply acquiring more characters with points). I was looking forward to the push your luck aspect and the engine building core of the game. After our first play, I was quite underwhelmed. I'm not sure why. I enjoyed being able to repel the ships, that was my strategy, but I found I didn't have anything else I wanted to do. Just collect points when they present themselves. The push your luck aspect was ok, but not as exciting as I had hoped. The end score was tight, 13-12-11. But we didn't say play again! So that was sad. Anyway, I insisted on another go at Port Royal. I'm not giving up on it after a play. So that was how we ended the night, one more to see if we can find something more in it. This time it was slightly better. We changed our strategies. We pushed our luck less, took more money, and waited for the opportune time to strike. It flowed much faster, we looked out for what we didn't want to give each other, but in the end, it was still alright. I do want to play again to see if it's better with more players - we played it 3 players. But somehow I feel slightly disappointed. Not sure if I will keep it. I was hoping for a game of much anticipation with each card draw and laughter and mocking at each player's futile attempt. But the card drawing felt robotic for us. Not sure if it was cos it was late already. What's worse than joining the 3 card club? Becoming the founding member of the 2 card club! The big problem was the luck in the game. Yes it is push your luck, but sometimes it's really not under your control at all. We had a few 3 card hands and an unlucky 2 card hand. In our 3 player game that was no problem, but I can imagine in a 5 player game how frustrating that would be - having to wait 4 turns for the deck to come back to you. Is the push your luck too punishing for the lack of excitement it brings? That could possibly be true, but I'm not sure. I would like more control and I would like the game to not boil down to who got the most money is the winner. The characters are EXPENSIVE, and thus you need to really save up for them. So players who take a quick lead are hard to catch up on. And the luck from the tax is also frustrating. I agree that is something you can plan for, just that it's something I thought I would mention. All in all, I feel it's more push and ride your luck than it is push your luck with engine building. The engines are not all that cohesive and useful as they relate to certain events/cards only and those are hard to combo as well since you don't know what is going to come out. Those that are ongoing like the jester and the governor are great, but ultimately I found the cost to buy them and the eventual use didn't seem to tally especially when the game is soon over. We'll see, but for now I think I'm slightly down with what I have found in it. Please get better! !